“It will be evident to any reader, who has followed me so far, that the Buddhist belief is permeated by what I have described as a distinctive, ‘a peculiar note of Modern Spiritualism – the presence and guardianship of departed spirits'(!? )1 I confess that this struck me with some surprise, and, I may say, pleased surprise, for I had come to think that there was a marked antagonism between Eastern and Western modes of thought and belief on this point. We have heard much in disparagement of this special article of faith from some friends who have told us a great deal about the theosophical beliefs of the Hindus and who have chanted the praises of the Buddhistic as against the Christian faith with vehement laudation of the one and with abundant scorn of the other. . . . But be this as it may, we have been told so often, that we have come to accept it as a lesson from those who know better than ourselves, that our Western belief in the action of departed human spirits in this world of ours is a crazy fallacy. We have believed at least that such was the Eastern creed. For ourselves, we (some of us at least) prefer our own experience to the instructions of any whose dogmatic statements are so sweeping as those with which we are met from Eastern experts. The statements and claims made have seemed to us altogether too vast. It may be, we are driven to think, that departed spirits do not operate in the East, but at any rate we find that they do act in the West. And while we are far from declining to recognize the truth that pervades much of the Spiritualism of the East, and have tried our best to induce our friends to widen their view by adopting it in some degree, we have been sad to think that it should so absolutely contradict the experience of the West. No wonder since they have in Buddhistic and Brahmanical Esotericism their own special and technical names whose significance, Mr. Lillie – if he understood their meaning as correctly as he did the word Kama – was just the person to overlook, or include in the generic name of “Spirits.” We will not try to personally argue out the vexed question with our friend, M. A. (Oxon), as our voice might have no more authority with him than Mr. Lillie’s has with us. But we will tell him what we have done. As soon as his able review reached us, we marked it throughout, and sent both the numbers of the magazine containing it, to be, in their turn, reviewed and corrected by two authorities. We have the weakness to believe that these Specialists in the matter of esoteric Buddhism may be regarded as far greater than Mr. Lillie or any other European authority is likely to ever be; for these two are: – (1) H. Sumangala Unnanse, Buddhist High Priest of Adam’s Peak, Ceylon, the teacher of Mr. Rhys Davids, a member of our General Council and the most learned expounder of Southern Buddhism; and (2) the Chohan-Lama of Rinch-cha-tze (Tibet) the Chief of the Archive-registrars of the secret Libraries of the Dalai and Ta-shii-hlumpo-Lamas-Rim-boche, – also a member of our Society. The latter, moreover, is a “Pan-chhen,” or great teacher, one of the most learned theologians of Northern Buddhism and esoteric Lamaism. From the latter we have already received the promise of showing how very erroneous are, in every case, the views of both, the author and his reviewer, the message being accompanied by a few remarks to the address of the former which would have hardly flattered his vanity as an author. The High Priest Sumangala, we hope, will give his ideas upon “Buddhistic Spiritualism” as well, as soon as he finds leisure – no easy matter, by the way, considering his engagements. If the authority and learning of Mr. Lillie, after that, will still be placed higher than that of the two most learned Buddhist expounders of Southern and Northern Buddhism of our day, then we will have nothing more to say. Meanwhile, none will deny that esoteric Buddhism and Brahmanism are one for the former is derived from the latter. 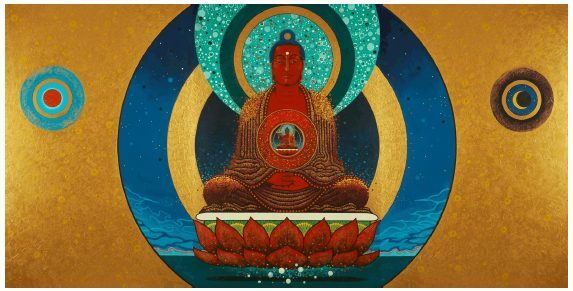 It well-known, the most important feature of reform, perhaps, was that Buddha made adeptship or enlightenment (through the dhyâna practices of Iddhi) open to all, whereas the Brahmans had been jealously excluding all men without the pale of their own haughty caste from this privilege of learning the perfect truth. Therefore, in the present connection we will give the ideas of a learned Brahman upon Spiritualism as viewed from the esoteric stand-point. The author of the article which follows, than whom, no layman, perhaps, in India is better versed in the Brahmanical Occult Sciences3 outside the inner conclave of the adepts – reviews in it the seven-fold principle in man, as given in Fragments of Occult Truth, and establishes for that purpose an exhaustive comparison between the two esoteric doctrines – the Brahmanical and Buddhistic – which he considers “substantially identical.” His letter was written at our personal request, with no view to polemics, the writer himself being probably very far from the thought while answering it that it would ever be published. Having obtained his permission, however, to that effect, we now gladly avail ourselves of the opportunity. Besides being the best review we are likely to ever obtain upon so abstruse a subject, it will show M. A. (Oxon), and our other friends, the Spiritualists, how far such authors as Mr. Lillie have seized the “root-principle” of the Asiatic religions and philosophy. At all events the readers will be enabled to judge, how much modern Spiritualism, as now expounded, is “a permeating principle” of Brahmanism, the elder sister of Buddhism. 1 The italics and points of exclamation are ours. We would like to know what the learned priests of Ceylon, the lights of Buddhism, such as Sumangala Unnanse, would have to say to this? – Ed. 2 We have not read Mr. Lillie’s book: but if he teaches in it many other things no truer than his idea that Kama means “Death” his authority is likely to prove of a most fragile kind Kama never meant death, but lust, desire; in this sense – a passionate desire to live again. – Ed. 3 See article [by Subba Row] “The Twelve Signs of the Zodiac” by the same author in the November number of the Theosophist. – ED.